I have three friends Bob, Sam, and Maya. We all deposit some of our pocket money together to the electronic wallet. On tough time we can move money from each other accounts as Bob can transfer money to Maya or Maya to Sam. To make transfer easy we had made a bar chart app which shows how much money each person has and the user can transfer using drag and drop. As in the below chart. 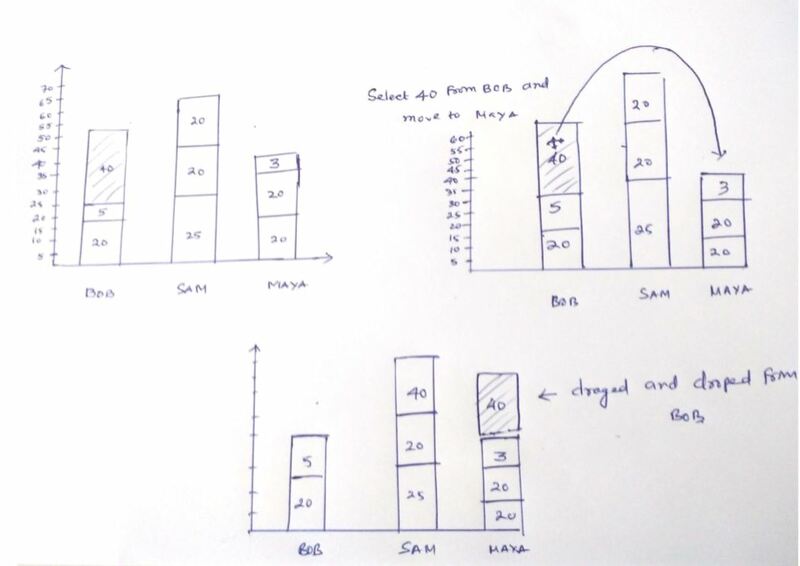 Bob, Sam, and Maya keep depositing and chart keep increasing. 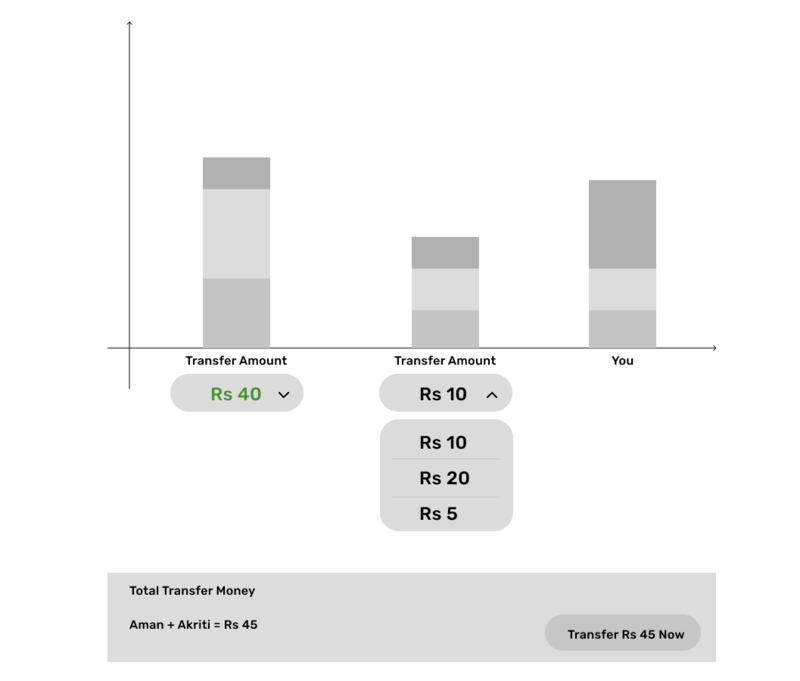 Money can be transferred using drag and drop from one bar to other like in below example Bob transfer its 3rd-week money to Maya using drag and drop. Electronic wallet has a restriction to not split the money and transfer. How much chunk is deposited same can be transferred not by splitting. Bob can transfer 20,5 and 40 not splitting any to the intermediate value. We wanted to build a visual way of transfer, is it a good user interface? Its a stacked bar chart, in which if one amount becomes small drag and drop is tough.Any alternate way to do this? Any alternate way to do this by nice visual user experience? Group of 3 users is only possible at a time. Mostly user has the requirement to transfer the same amount which is already available to some other user. This UI has lot's of usability issues like what if Maya just want 10 bucks and nobody has exact 10 units on their bar chart. Do you have options for that, if yes, then where are they? Scalability issues What happens to UI if users make 3-4 transactions per day or 20 transaction per week. Won't it be looking messy? Large number of users What if there are 20 users in the group. Not mobile friendly Dynamic Charts are generally not mobile friendly. Go Back to your drawing board and first create various use cases followed by user journeys and then try achieving your objective with a simpler layout, like a list etc. Once the journey of your module is figured out and achieved with simplicity, then let your creative brain fly. While creating UI take care of the above points I have mentioned in UI issues list. If your objectives are met by this UI and only issue is drag and drop, one solution I can think of is that you allow user to adjust the Y axis scale . So if user want to transfer 1 rupee and the scale is adjusted to from 1-100 to 1-10, fractional size of 1 unit will increase and then you can drag it. Else I will advice you to keep the charts just for the display and transfer options in just dropdown beneath. So even if you are just doing the drag and drops, a list of total transfers is created at bottom which user can confirm by clicking on "Transfer x money now" and the money will be transferred. This way, you can transfer even Rs 1, without scaling the axis. Not the answer you're looking for? Browse other questions tagged usability gui-design user-behavior ux-designer charts or ask your own question.